I planted our garden late this year because we were planning to sell our house and I wasn’t sure we’d have any garden at all. But look at our okra. Barely three feet high, the plant are already making pods like crazy. I had to take a moment from tiling bathrooms to harvest some quick, before they become too tough to eat. Okra is a standout vegetable for the District of Columbia. It loves heat and humidity and I’ve never known one to fall victim to any pest. They just make pods like crazy. At a certain point, we will be harvesting twice a day. A vegetable gardener could hardly ask for more. One of our favorite recipes is a “smothered” okra–a stew, really, starting with onions sauteed in bacon grease, then adding sliced okra, corn off fresh off the cob and diced tomatoes. Touring the garden, I noticed some of our peppers had ripened–a Serrano-style pepper, and some banana peppers. I thought these would add a nice bit of heat and flavor to our smothered okra, and they did. This will be a perfect side for the Texas-style brisket I put on the electric smoker this morning–along with some big chunks of mesquite–and a “free ranger” chicken I picked up last week at Joel Salatin’s farm day,now brining and headed for a date with the charcoal spit. Meanwhile, I’ve harvested a cooked a big pot lof our favorite Italian style green beans. This promises to be a might fine eating summer. My dd’s new favorite way to eat okra is pickled. Think dill pickles but okra. Sadly, I have no okra plants this year (long story….) but hope to find a large quantity as I promised to make okra pickles and need to follow through. 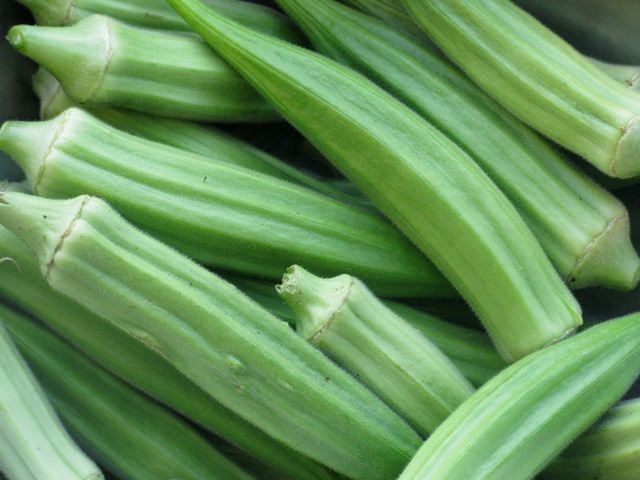 Okra is one of the favourite vegetable in july for my family. We are very happy to eat it and we also make different recipes from that. Okra is a vegetable I have never been fond of. The taste is fine, but the texture is too slimy for me. Does this recipe cut down on that? It certainly sounds delicious, especially with the added heat. I’ve never had a problem with slimy okra except when I prepared it raw. Just tried your smothered okra recipe, had it over some baked potatoes this evening and it was wonderful! Even got my one year old daughter to eat some of it so I call it a success. Thanks for the idea! Cooking with acid can cut back on the slime – I’ve done a great ginger lime okra that even the okra haters in my family enjoyed. This sounds great. I love that you made a recipe from what was fresh in the garden. I grew up on a Volga German ranch in Wyoming, and what was fresh and ready to eat often determined our dinners. We had wonderful dinners, my Mom was a great cook and I was fortunate enough that she taught me. I have such good memories of this. My wife and I yesterday put in a mid-summer herb garden after unexpectedly having additional garden space (long story involving a microburst, a neighbor’s tent and a lilac tree). We were lucky enough to find a local (Chicago) area landscaping company having a blow-out herb plant sale and we’re now hoping for an extended summer. Love your blog. Maybe we’ll try okra next year, but I’m not sure it (normally) gets hot enough here. Chicago summers are pretty hot. You should give okra a try.